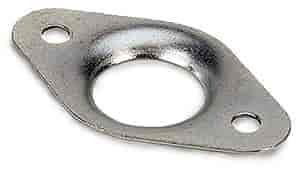 Reinforcement plates provide a secure metal backing to solve the problem of quick release fastener attachment rivets pulling out of fiberglass hood and body panels after repeated useage. Also prevents fastener spring brackets from cutting into body panels. Use With Quick Fasteners p/n 710-71280, 710-71290, 710-71300, 710-71310, 710-71350, 710-71360.